‘Danish cuisine?’ you would probably ask, ‘isn’t this site about Dominican cuisine?’ Yes, indeed, but this hasn’t stopped us from writing about Caribbean cuisine; and the fact that we love and promote our vernacular cuisine does not mean that we do not enjoy exploring what lies beyond our little chunk of island. Besides, I have another good reason to write about Danish cuisine, but we’ll get there later. A good start for this would be to tell you how Denmark is alike and how it is different from the Dominican Republic. Despite the abysmal differences between Denmark and the Dominican Republic, it isn’t hard to find the two things that are common to both countries. Denmark is roughly the same size as the Dominican Republic (if we ignore Greenland of course). As is the Dominican Republic, Denmark is almost entirely surrounded by water, Denmark more so because it is comprised by the mainland, two large islands and countless smaller islands; so many that even those big enough to be visible in a map can’t be counted with my fingers and toes. And the similarities end there. A former empire that also comprised what is today Norway and Sweden, Denmark is a very prosperous country, home to the infamous Vikings, and the oldest monarchy in Europe. Of course we also have to mention that Denmark, situated between Norway and Germany, is a very cold country, which, as one would expect, has greatly influenced the culinary culture of the Danes. Despite its climate, Denmark is a fertile country with a flourishing agriculture and which exports dairy products as far as the Dominican Republic (a very popular brand of powdered milk in D.R. is in fact Danish). If I have to describe Danish cuisine in two words these would be ‘fattening’ and ‘delicious’. The first is not a problem for Danes, who burn quite enough of that fat just keeping themselves warm 9 months a year. And apparently it works, because, as far as I can see, Denmark has even less obese people than we do (this may not be statistically accurate, just my impression in my visits to the country). Potatoes are the staple of Danish cuisine and are prepared in as many ways as we can prepare rice, and they stir in the Danes the same passion we feel for rice. 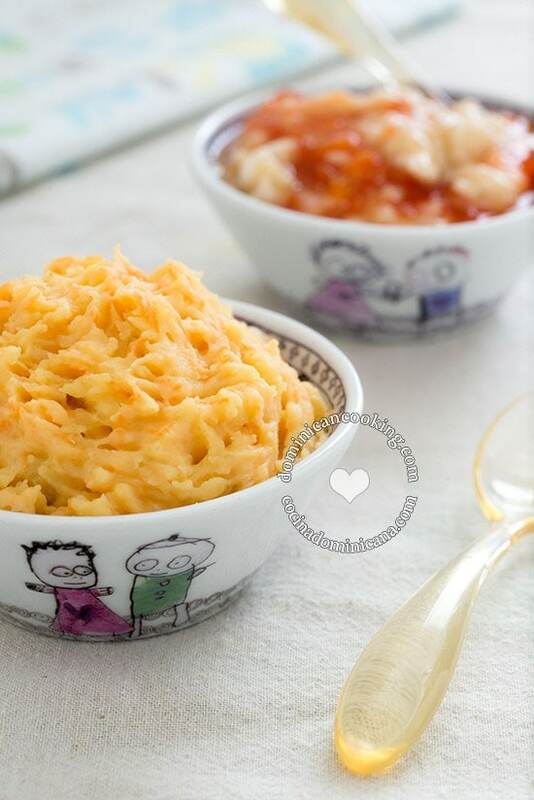 Some traditional Danish potatoes dishes are ‘burning love’ (mashed potatoes with bacon and sautéed onions), glazed potatoes (similar to our platanos al caldero, but with less sugar) and creamed potatoes (boiled, diced potatoes in a béchamel-type sauce); but these are only an example of the creativity Danes put into preparing their beloved potatoes. Land of indescribably-good butter, Denmark has a rich and varied baking tradition. It isn’t a coincidence that in many countries ‘Danish’ is synonymous with pastry (although the specific pastry known everywhere as ‘Danish’ is known in Denmark as ‘Viennese’, go figure). And then, of course, we also have to mention butter cookies, another thing for which Denmark is famous. Bread, of which Denmark has countless types, is part of every Danish breakfast and the base for Denmark’s most unique dish: the open sandwich. Fish, one of Denmark’s exports, is indelibly attached to their culinary tradition. The variety of fish available in Danish markets is dizzying. For somebody like me, who don’t eat meat but eat seafood, this can be a blessing. Choose between salmon, eel, trout, garfish, mackerel, cod, herrings, plaice, and many more; add to this that you can buy them fresh, salted, pickled, smoked, and cook them fried, grilled, stewed and in countless other ways, and there is no way you will be bored. But fish is not the be-all, end-all of Danish cuisine. Danes are confessed carnivores, so if meat is your choice you will be at home in Denmark. From the roast duck that graces the Danish Christmas dinner table, to beef, pork, and game, all is prepared without regards for anything but great taste. And although we mentioned it above, we have to stop and talk some more about that uniquely Danish tradition that is the open sandwich. It doesn’t take a brain surgeon to figure that an open sandwich only has one slice of bread; but as guessing goes that is as far as you can get, because there isn’t just one kind of open sandwich. Combine as many ingredients as there are in the Danish cuisine and you’ll come up with nearly infinite combinations. It all starts with a slice of bread (sometimes half a slice) smeared with a fair amount of that unhealthily delicious Danish butter, now you can top it with finely-cut slices of salmon (pickled or smoked), or herrings (pickled), or cold cuts, or even sliced potatoes. To that you can add finely sliced cucumber, caviar, and the sauce of your preference, be it tartar sauce, mayonnaise or remoulade, and garnish with chopped parsley, dill or capers. The possibilities are endless. There is one thing Danes have in common with Dominicans: the love for beer. But while Dominicans’ faithfulness to a certain brand comes close to religion, Danes have so many brands from which to choose, all of great quality, that it is difficult for them to remain faithful to just one brand. A Danish meal is not complete without many rounds of skål, Danish for ‘cheers’, so from the Dominican Republic I raise my glass a su salud, to Danes, the happy, creative, organized, sensible people of the north. And I should know that… because my husband is a Dane.